Chain link portable fence is an effective solution for construction sites, domestic building sites and vacant blocks of land. It is an system which contains the fence panels, clamps, crossing bars, feet, bracing and other accessories. 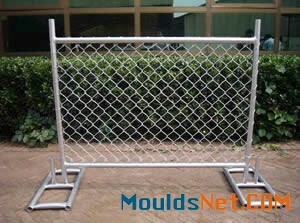 chain link portable fence panel without any welded point. 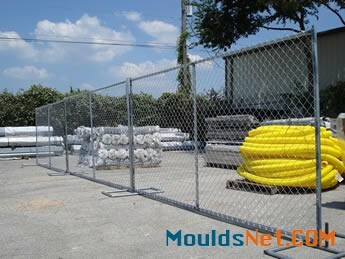 Chain link portable fence panel is a kind of panel which infilled mesh using the woven mesh. 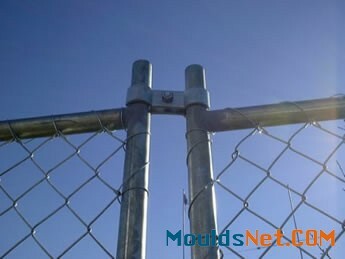 Compared with welded portable fence, the chain link portable fence take the advantage of without welded points. The frame of the portable fence are strong and durable, but the infilled mesh is the weaker parts of the whole portable fence, the chain link portable fence can be removed and replaced easily and improve the service life of the portable fence. Wire diameter: 2.0mm - 5.0mm. Mesh size: 1-1/2" - 2-3/8". Panel Height: 4’, 6’, 8’. Panel Length: 8’, 10’, 12’, 14’. Finish treatment: hot dipped galvanized. 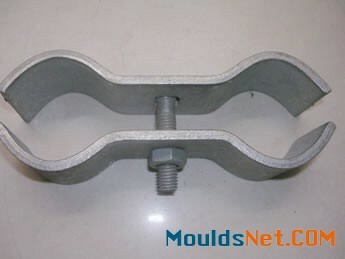 Chain link portable fence clamp is designed to connect the neighbor fence panels for stability. 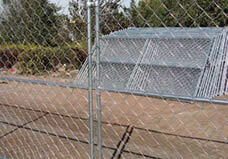 It can keep the portable fence in place even in the high wind or harsh environments. Chain link portable fence clamp. Chain link portable fence clamp can get the neighbour fence panels together. 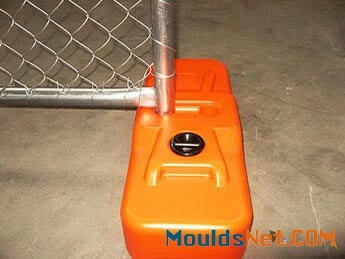 Chain link portable fence feet can fix the fence panels on the ground. They are the special characteristics of the portable fence. The portable fence using the feet replaced drilling or digging into the ground. The portable fence feet has various types. The main three types are plastic feet, metal feet and the concrete feet. the metal feet can be one peg and two peg. The one peg feet is ideal for the end panel of the fence. Besides, the metal feet can be hot dipped galvanized and powder coated. Plastic chain link portable fence feet. Concrete chain link portable fence feet. Powder coated metal chain link portable fence feet. Hot dipped galvanized metal chain link portable fence feet. 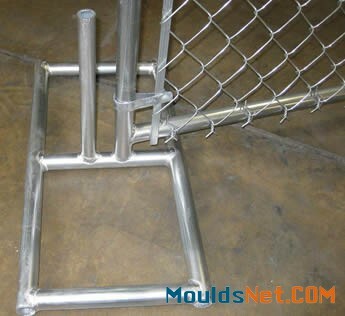 Chain link portable fence cross bar can supply the extra strength and stability for the fence panel. It can prevent the fence panel from blowing down by the high wind. 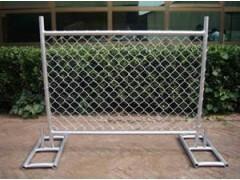 The chain link portable fence cross bar can be vertical, horizontal and both direction. Horizontal cross bar of the chain link portable fence. Vertical cross bar of the chain link portable fence. Vertical and horizontal cross bar of the chain link portable fence. Additional accessories can be bracing, fabric, shade cloth and barbed wire. Bracing is an useful accessory which can supply the extra strength and stability to prevent fence panels from being blowing down by the high wind. Fabric can be installed in the diamond mesh to ensure the privacy of the sites. Shade cloth can prevent the dust from blowing off the construction site, also it can prevent the pedestrians from looking into the sites and assure the privacy. Barbed wire can deter intruders and protect the safe of the sites. 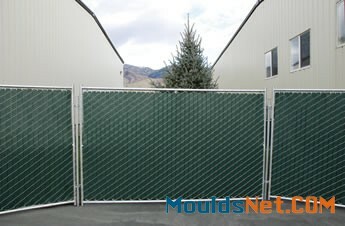 Chain link portable fence panel can supply the extra strength and durability for the fence panel. 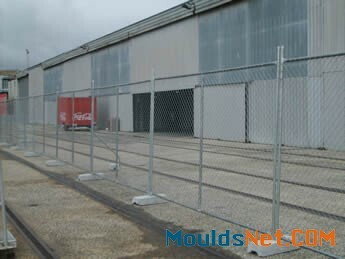 Chain link portable fence slats can ensure the privacy of the sites. Free standing. It does not require drilling. Durability and high strength. Horizontal and vertical bracing provide durability and high strength in the high wind or harsh environments.. Flexible. It can be used in any surface and easy to install and remove. Corrosion and rust resistance. The hot dipped galvanized supply a corrosive resistant surface for the fence panel. Safe. It can protect the valuable assets and personal property. Long service life. 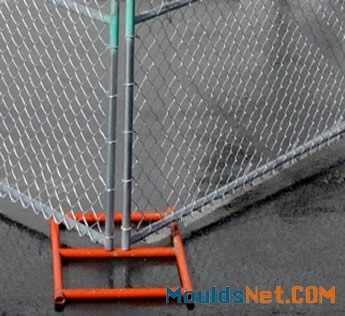 The infilled woven mesh can be removed and replaced easily, so it can improve the service life of the portable fence. 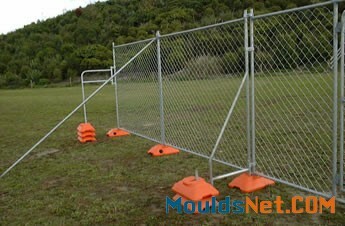 The chain link portable fence can be used in the construction sites to secure sites and equipments. The chain link portable fence can be used in the public events, such as the carnival activities, festival activities and sports events. 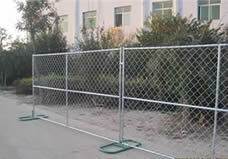 It can be used in the walkways or securing sites to separate pedestrians from restricted areas. 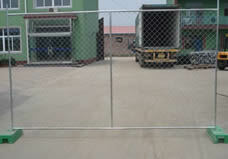 Chain link portable fence can be used in the factory to prevent the equipment from being stolen.